For years Cornwall has been desired as a holiday destination for people all over the UK and the world, with its lovely country side, coastal towns, and long sandy beaches. Many tourists flock here during the summer for its sub-tropical climate due to its southerly latitude and the influence of the Gulf Stream which is why you will find palm trees dotted along the coast line. Did you know Cornwall also has a very vibrant golfing scene, which is no surprise with that warm climate, rolling countryside and long stretches of coast, making Cornwall a prime golfing destination. Founded in 1901 the Cornwall Golf Union boasts an impressive 33 golf courses affiliated to it with the oldest one dating all the way back to 1889. 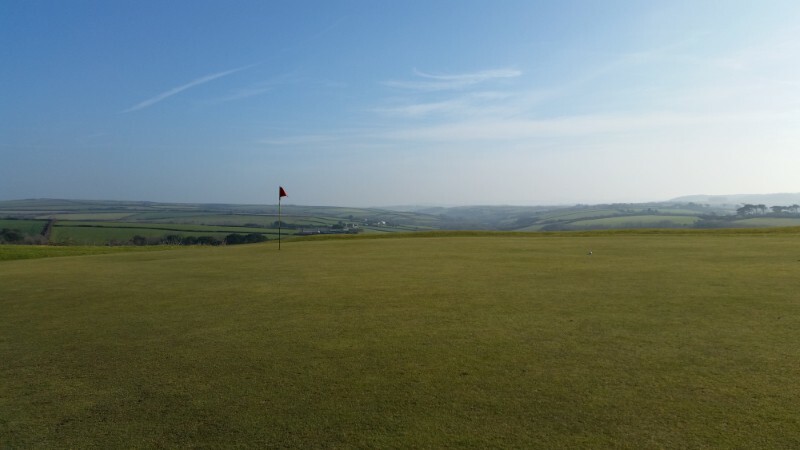 So if you’re a golfing enthusiast like me, and thinking of visiting Cornwall for a few rounds of golf I have listed a few professional golf courses near our holiday park to get you into the ‘swing’ of things. Boasting a challenging and well-maintained championship golf course as well as breath-taking views up and down the coast. The course is difficult, so a novice golfer may find this very tricky and be prepared to lose a few golf balls. The majority of holes are played over dunes, so there are a lot of blind shots. Perranporth our closest golf course is only a 5 minute drive from Perran Springs Holiday Park. One of Cornwall’s finest links courses with magnificent views over the Atlantic Ocean. The excellent condition of the course means you can enjoy a golfing challenge all year round. The greens here run very fast and it’s a true links course. The course can slope on certain holes and can be tricky if you’re tee-off isn’t accurate. Bunkers are deep here, so avoid at all costs if you want to make par. Newquay golf course is only a 10 minute from from the campsite. Only one mile away from the beautiful cathedral city of Truro, you can enjoy playing one of Cornwall’s best golf courses in a natural parkland setting. An 18 Hole, Par 67 and 5,339 yards mature course. Truro golf course is about 20 minutes drive from us. A beautiful North Cornish hilltop heathland golf course set on the North Cornish Coast, enjoying amazing valley views towards the sea. Well maintained with some long straight holes, the greens are deceiving and putting in 2 is a challenge. There are a few water challenges with small ponds, especially on the 4th hole. The 11th hole is a favourite which is a dog leg and very steep sloping green. Merlin golf course is about 25 minutes drive from Perran Springs. With panoramic views over the Cornish countryside, it is suitable for golfers at all levels of skill and experience. Set within Tehidy woods some holes are tree lined whilst others more open, with a few ponds to overcome during your round. Tehidy golf course is about 30 minutes drive from Perran Springs. The 18 hole course is set in the magnificent grounds of historic Killiow Estate and presents a challenge to golfers of all standards. There is a golf driving range here and the holes are set in parkland grounds. If you’re also into wildlife you may also see some buzzards, swallows, woodpeckers, jays and rabbits during your game. Killiow is about 25 minutes drive from Perran Springs. 9 holes, 2143 yards this course is well maintained and great for a quick game in the evening, leaving you all day to spend with family on the beach or sightseeing. The holes are well designed with a number of small bunkers, approach to the greens can be challenging if you choose the wrong iron shot as your approach shot. The 6 hole is one of the longest, but holes 3, 7 and 9 are my favourites. There is also a driving range here to practice before you play. Treloy golf course is about 25 minutes drive from Perran Springs. The above is a guide to some of my favourite golf courses near our campsite. So if your looking for a golf holiday in Cornwall, there are plenty of golf courses to choose from. I play golf and am a member of Newquay Golf Club, so if you require any information whilst staying on our campsite please ask for me, Andrew.